McDonald's just released a new dessert over in Italy that's essentially a Nutella "burger," which is to say that it's two halves of a bun sandwiching a layer of Nutella hazelnut spread. 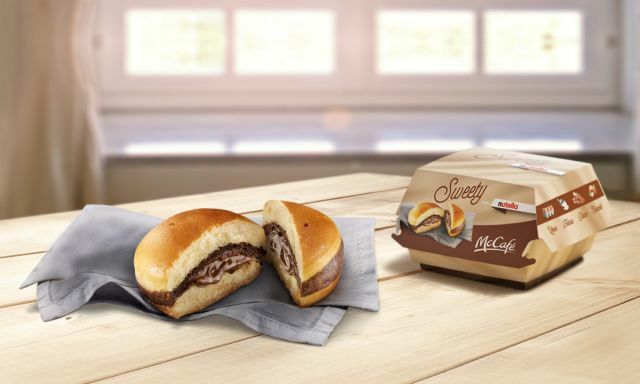 They're calling it the "Sweety con Nutella" (which translates to Sweety with Nutella) and it's offered as part of the McCafe menu. It comes in a clamshell box that, whether by design or not, adds to the burger feel. It also appears that the bun is baked with the Nutella inside, which gives the Nutella a bit of a crust at the edges and makes it a little like a beef patty. The burger chain describes the desserts in the following manner: "Sweety with Nutella is an exclusive innovation that is really impossible to resist: soft bread with a heart of Nutella to be discovered. A soft sweetness, suitable for any time of day."